Last step for Orca Emergency Response Bills! With only a few weeks left in the legislative session, the package of orca recovery bills are in the home stretch in the House and the Senate! 2SSB 5577 – A bill to decrease vessel noise and disturbance. 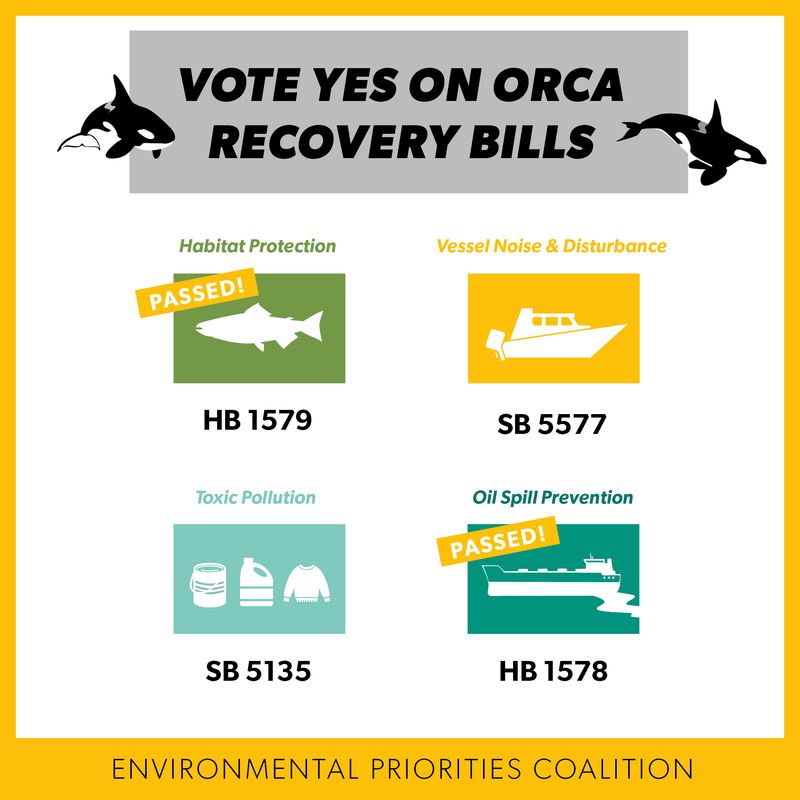 SSB 5135 – A bill to reduce toxic pollution affecting orca families and our families. ESHB 1578– A bill to reduce threats to Southern resident orcas by improving the safety of oil transportation. PASSSED! 2SHB 1579– A bill to protect habitat for salmon and forage fish. PASSED! Urge your state legislators to support the Orca Emergency Response Priority. Enter your information to sign on to this petition. I sincerely believe that you, like me, cannot imagine a future without the Southern Resident orca population swimming, playing, foraging, frolicking, and just being in the Salish Sea. I urge you to vote yes on - 2SSB 5577, concerning the protection of southern resident orca whales from vessels - SSB 5135, preventing toxic pollution that affects public health or the environment. Right now may be our last chance to reverse the declining trend of this population. The orcas need our help to address immediate threats facing this population. The state legislature has a remarkable opportunity to pass bills that will prevent toxic pollution, decrease vessel noise and disturbance, protect key habitat for salmon- their prey, and measure to prevent oil spills. Thank you and I look forward to your reply. Hello, my name is _____ and I live in ______. I am calling to urge you to recognize the value of fully funding environmental programs. Environmental programs are a mere 1.9% of the state operating budget but these programs provide benefits to communities across the state through clean air, clean water, and thriving communities that make Washington a great place to live, work, and play. Thank you for all of your hard work during the 2017 legislative session and for considering my comments. I look forward to hearing from you, I can be reached at __(Phone Number)__.